ICWUSA.com, Inc. has received pre-approval from the State of California (known as an OPM) that the Ultra and MD mounting tracks meet the requirements of the 2016 California Building Code for fixed equipment anchorages used in a seismic zone. 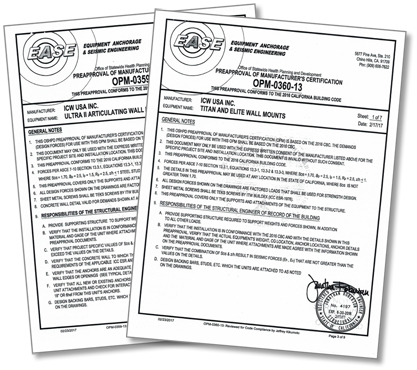 This new certification is in addition to our earlier OSHPD pre-approval certification of compliance (known as an OPA) to the 2010 California Building Code for fixed equipment anchorages used in a seismic zone. Any of our computer mounting systems mounted to our OPM-listed tracks are pre-approved for use in California health care facilities, as long as the overall weight and center of gravity distance does not exceed that listed in the OPM document.